Who produces the Donut sites? How do the Donut sites make money? What is the idea behind the Donut site? What areas of advice does the Donut site cover? How do I become a Donut partner? As well as the websites, what else do the Donuts offer small businesses? Atom Content Marketing - we are based in Bristol and have been providing practical, reliable advice to small businesses for more than 25 years. Our clients include a long list of leading private and public sector organisations. You can find out more about us by visiting our website. It is important to note that our commercial partners, as outlined below, do not have any involvement in the editorial process. All of our core 'Topic' content is independently written and signed off by our team of small business writers and experts. Our aim is to provide genuinely useful, reliable information and offers that will help small businesses be successful. We work with corporate organisations who have products and services relevant to small businesses. We clearly mark and place these offers on related content pages and generic pages (such as the Home pages) across the sites. As above, the content on these pages is not influenced by the corporate partner in any way. If corporate partners would like to feature their own content on the sites, we restrict this to the Hub areas of the site (eg see the Digital Growth Hub for Microsoft). The blog is the clearly marked section of the site where we allow paid-for articles. Our blog contributors pay a small fee to feature their article. However, all articles are subject to editorial approval and will be edited by our specialist team. Blogs include a credit to the author at the end of the article and are clearly marked as a 'sponsored post'. Some of our revenue is generated by affiliate links. That means that we earn a small commission or fee if a user follows the link and takes action on a partner site. Links that are clearly to commercial partners' products or services (eg that are specific about the offer, or that mention the partner's name) are not highlighted as affiliate links. However, where an affiliate link is placed within the content of core 'Topic' content these are marked with an asterisk. We will only add an affiliate link if it is a natural fit and useful to the user - the content is independently written and not influenced by the affiliate partner. Our aim is to help start-ups and small businesses be successful by giving them access to free, reliable, independent advice about a range of key business tasks and issues, as well as money-saving opportunities through the website's commercial partners. 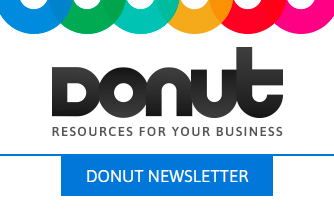 There are currently six Donut sites - Sectors Donut (covering more than 200 types of business) Marketing Donut, Start Up Donut, Law Donut (covering both business and personal law), Tech Donut (covering business technology) and Money Donut. The first, Marketing Donut, was launched in April 2009. Three months later we launched Start Up Donut. Law Donut was launched in August 2009, then IT Donut (now Tech Donut) in August 2010 and Tax Donut (now Money Donut) followed 12 months later. Each site took about one year to plan, write and build and has been further expanded over the years. Sectors Donut was launched in April 2016, with our publishing partner Parkes. We plan to add more Donut sites in the future. Are you looking for a cost-effective way of boosting your profile or getting your product in front of the hard-to-reach small business market? For more information, email Emma Jones or call her on 0117 407 0227. Good question. At Atom, we often draw 'donut diagrams' to map out collaborative projects. We wanted a fun and engaging brand for the sites and considered more than 60 other names, but Donut was the one we all liked, so it stuck. Oh, and it means we get to eat a LOT of doughnuts!